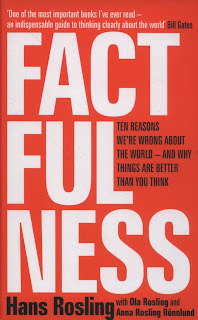 Although Rosling claims not to be an optimist, making it clear that he isn't saying everything is rosy - there's still a lot to improve - the fact is that most of our ideas of, for example, how bad world poverty is, education of girls, size of families and far more reflects what the world was like 50 years or more ago - where in practice it is now much better. One essential point that Rosling makes is that our division of the world into developing and developed gives a hugely misleading picture - because in reality (like most distributions) the majority of countries aren't in the very worst or very best part of the distribution, but somewhere in the middle. He advocates moving from the either/or split of developed/developing to four levels, based on average earnings, which gives a much better picture of the reality. Apparently the World Bank has adopted this approach but the UN and others still haven't got the message. 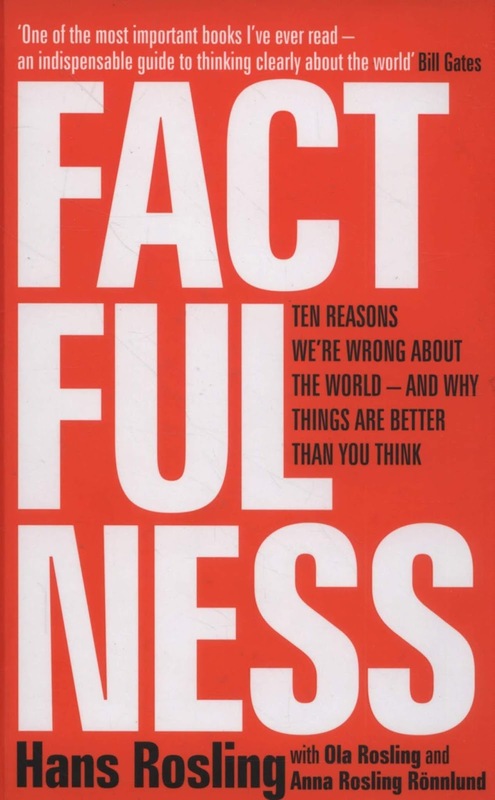 In Factfulness, Rosling looks at a set of ways we have a biased view of reality and what we can do to modify this. So, for example, he talks about our urge to divide populations into two ('the gap instinct') - rich or poor, privileged or not etc, etc. - where the reality is almost always a continuum with no gap. Elsewhere he takes on our tendency to extrapolate into the future with a straight line, where many trends are, for example S-shaped, the danger of always looking for someone to blame and much more. This is a very powerful piece of work that should be required reading for any politician, businessperson, educator and administrator. The whole thing is presented in a light, approachable fashion with lots of graphs and bubble charts. It's an easy read practically speaking, but a difficult one in the sense that the reader is encouraged to face their own misconceptions (and we almost all will have them - I certainly did). Just one example of the slightly weighted questions: one reads 'In all low-income countries across the world today, how many girls finish primary school?' The options are 20, 40 or 60 percent. Rosling's 'right' answer is 60 percent, then later he tells us 'there are only a very few countries in the world' where fewer than 20 percent of girls finish primary school. The trouble is, that word 'all' in the question. I'd argue the logical answer is 20, because that's the only number that applies to all countries - if larger numbers complete primary school, then 20 percent certainly do. It can't be true that 60 percent finish in all countries if under 20 percent do so in some. These are, however, minor concerns - Rosling and his associates have a powerful message that needs shouting from the rooftops.